Vegan Chocolate Mousse With Aquafaba | How To Make Aquafaba Recipe . 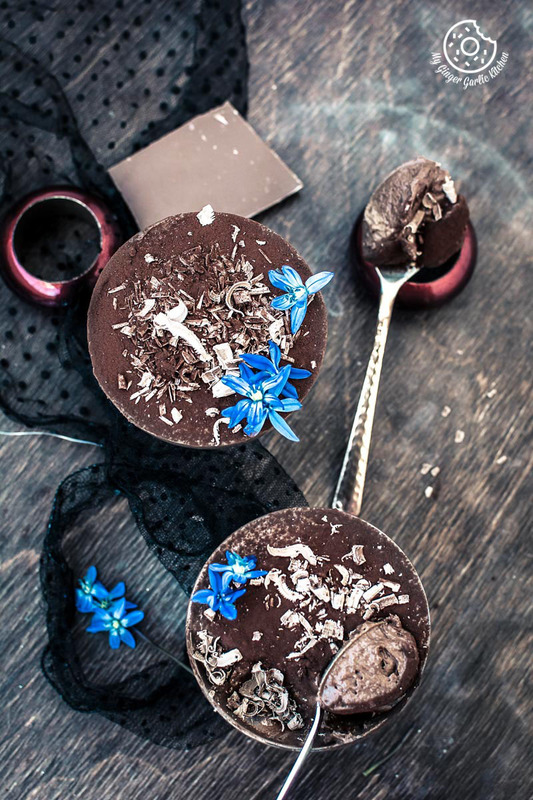 This beautiful vegan mousse is super airy and creamy, and it would be really hard for you to believe that there are no egg whites, or cream, or gelatin. And you won’t even taste chickpeas here. Today, I would like to start my post with a little appreciation for someone very special in my life — My Mommy. I wasn’t keeping well since Monday, so I wasn’t blogging actively. I am still not fully recovered yet, but just I wanted to publish this post before the weekend. It’s because I have shot and edited this video for this mousse recipe last week already. Because I wanted to share this one for the Mother’s Day. Mother’s Day is on Sunday, and I was running out of time. And what’s the use if I post it after the Mother’s Day. My mom is so affectionate towards chickpeas, and I believed she would really cherish this chocolate mousse. Even though my Mom is in India and not here with me on this Mother’s Day, I am still intending to share this easy peasy recipe with her. I have been sleeping mostly all the time since a couple of days, and so finally gotten so tired of sleeping. Thus, I wanted to do something productive which I could do while relaxing on the bed, making sure that I don’t exhaust myself. So, sharing this post sounded like the idea ticking off all these checkboxes. Talking about the Mother’s Day, it’s been many years now since my Mom and I have not been together on Mother’s Day. I know my Mom misses me so much and she wants to see me in person — since she keeps talking about it all the time over the phone. I am not sure if I would be able to meet her on Mother’s Day itself, but we can surely celebrate it when we’ll meet next time. So this post is for my AMAZING mom. She is the one who is always LOVING, who has always been so STRONG, who is always HAPPY, who never acts SELFISH, and who is always so full of GRACE — oh my dear Mommy! 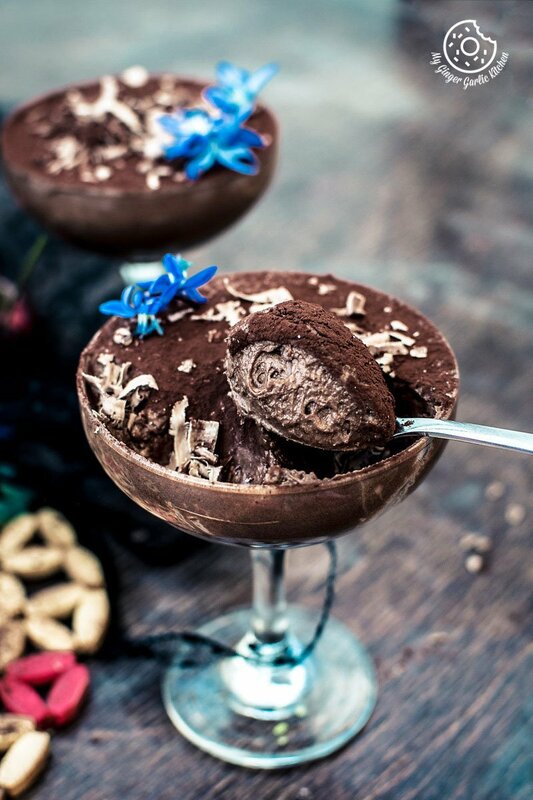 This Aquafaba Chocolate Mousse is made with only 4 ingredients. Plus, this is Vegan And Glutenfree. I am sure most of you know already about what Aquafaba is. But here’s a little intro for those who don’t know about it. Aquafaba is the thick liquid you get from canned or home cooked chickpeas. I always use up that liquid in my cooking, but I have also seen many people who throw away that protein packed liquid. 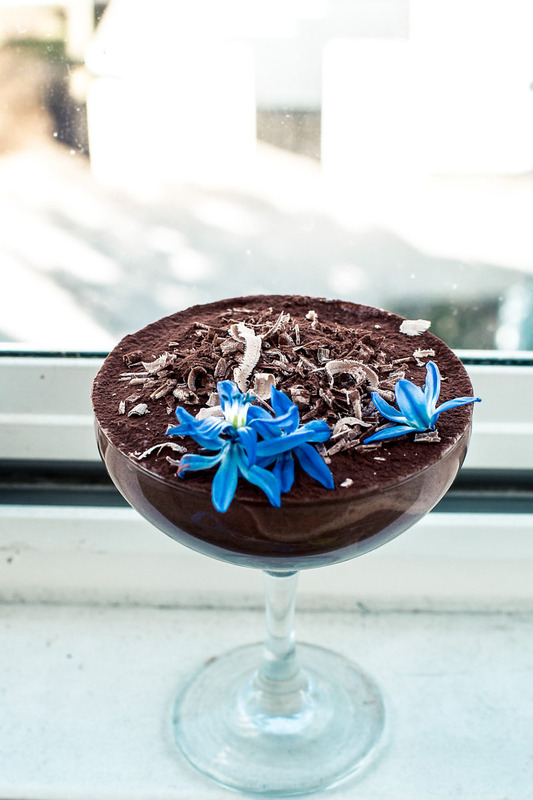 So, a word of advice, don’t throw it away the next time, because this Aquafaba can make a heavenly, vegan and gluten-free chocolate mousse too. I was fascinated when I first heard Aquafaba last year. It sounded so fancy. I didn’t know the fact that the water from the canned or cooked chickpeas can be whipped up just like egg whites. I was so amused when I first saw that. Aquafaba whips up as easily as the egg whites and you won’t be able to find a difference. And you can easily get the stiff peaks which are needed for the light and airy mousse. You can make mousse, meringues and many more delights using whipped aquafaba. After a good whisk, that water really resembles meringue. 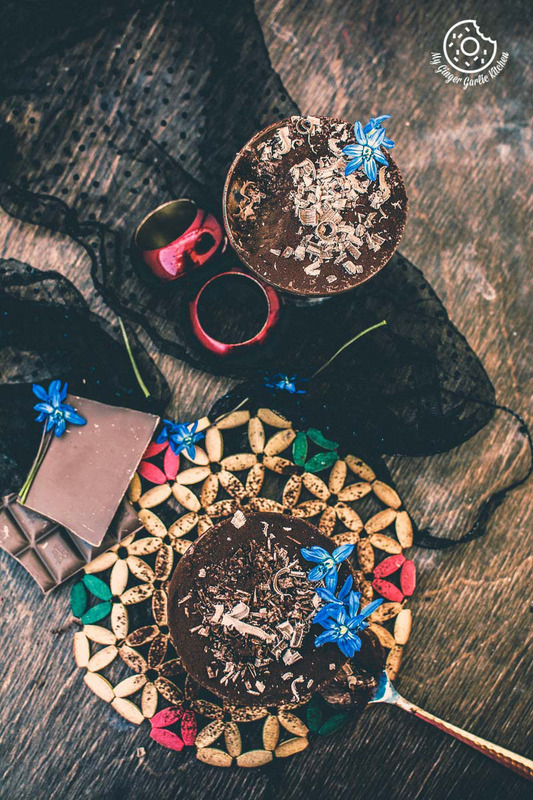 This beautiful vegan mousse is super airy and creamy, and it would be really hard for you to believe that there are no egg whites, or cream, or gelatin. And you won’t even taste chickpeas here. This chocolate mousse is ready in less than 20 minutes, and then it goes in the refrigerator for chilling. 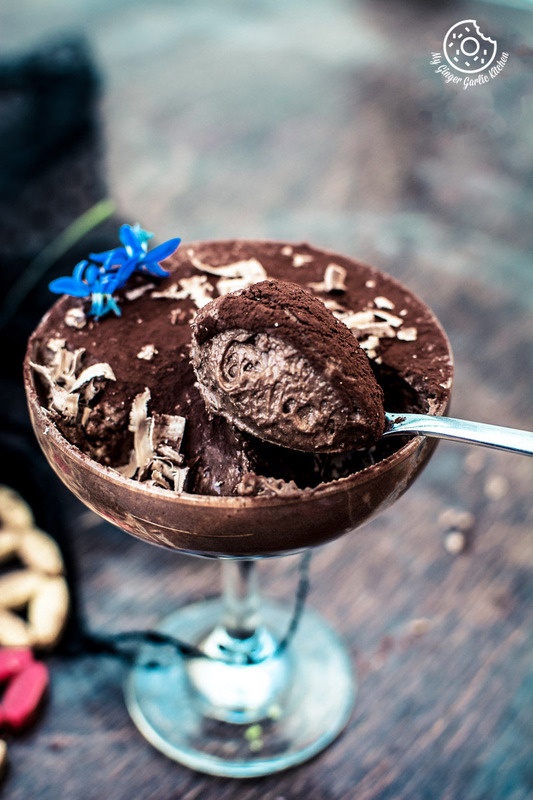 Once chilled and set, the mousse is everything you would want in a quick and easy chocolate dessert. It is bursting with an intense chocolate flavor, a light, airy and melt-in-mouth silky smooth texture. I dusted mousse with some unsweetened cocoa powder and chocolate shavings. But it would also be great with some fresh berries or oranges on top. 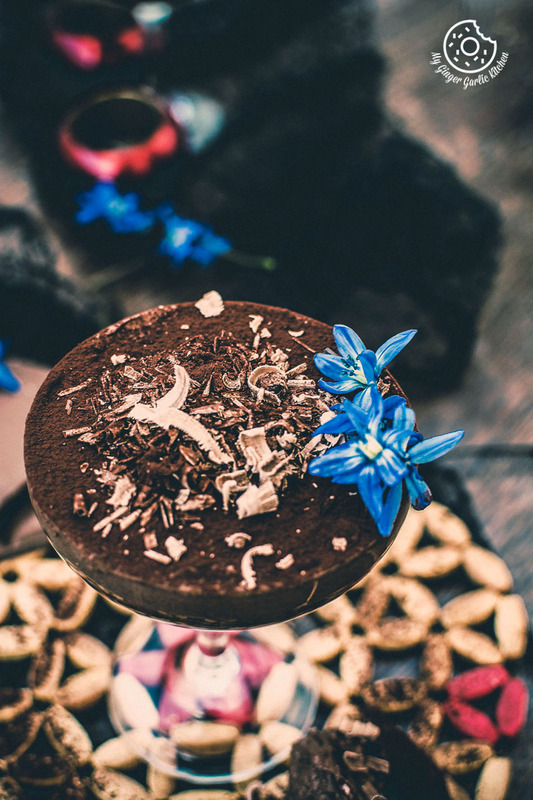 Let’s learn this Vegan Chocolate Mousse With Aquafaba | How To Make Aquafaba Recipe with easy step-by step video tutorial. 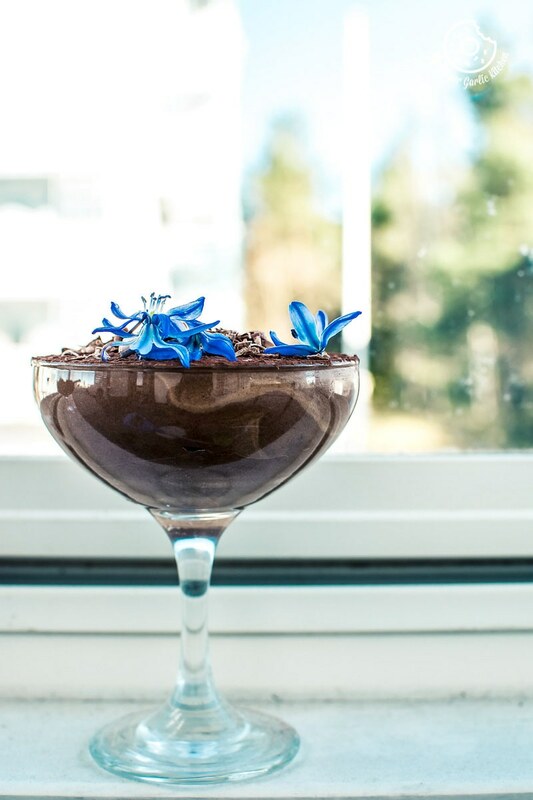 Vegan Chocolate Mousse With Aquafaba. 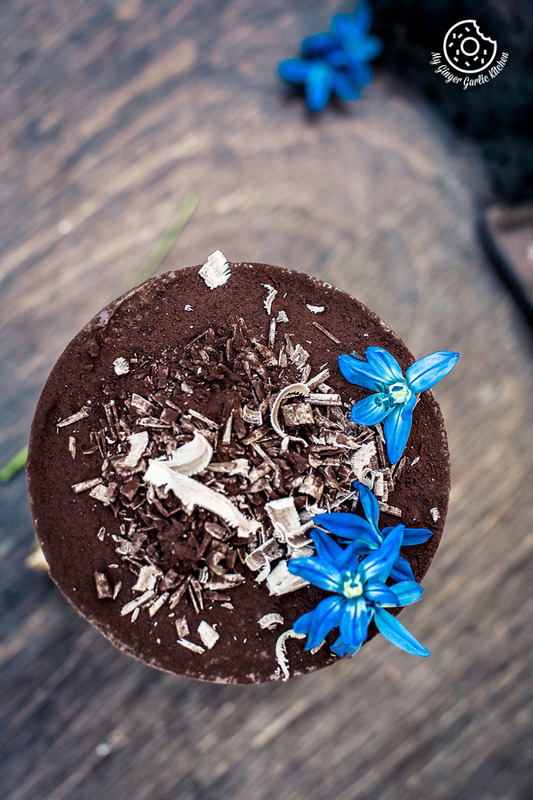 This beautiful vegan mousse is super airy and creamy, and it would be really hard for you to believe that there are no egg whites, or cream, or gelatin. And you won’t even taste chickpeas here. 1. Wash and soak 1 1/2 cup of dry chickpeas overnight in 5 cups of water. 3. When chickpeas are cooked, let the pressure come off naturally. 4. Open the pressure cooker lid and strain the liquid into a jar large bowl. 5. Refrigerate it overnight. Your aqauafaba is ready. 1. Place the chocolate in a double boiler and heat until fully melted. You can also microwave it. 2. Let the chocolate cool down. 3. Pour the aquafaba (chilled liquid of your chickpeas) and icing sugar or maple syrup in large mixing bowl and whisk with an electric whisk, or blender for 5 minutes. 4. Add vanilla and whisk more until peaks form and you have a fluffy white consistency. (This whole process would take about 10 minutes). 5. Add 2 tbsp freshly brewed coffee to the chocolate and stir it well. 6. Gently stir a third of the whipped aquafaba into the melted chocolate, until fully incorporated. 7. Fold in the remaining aquafaba in two additions, using a spatula and lifting the mixture in a circular up-and-down motion to avoid deflating it, until fully incorporated. 8. Gently fold in the chocolate with a spatula. 9. Using a soft spatula, gently and thoroughly fold chocolate into meringue until fully incorporated. 10. Pour into glasses or bowls. 11. Transfer to the fridge, and allow to set for at least 2-3 hours before serving. 12. 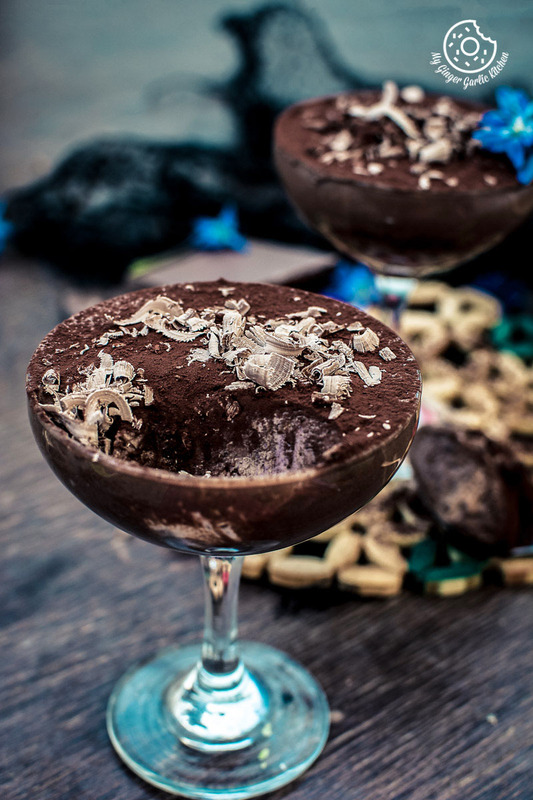 Dust with cocoa powder and decorate with chocolate shavings or aquafaba whipped cream. You can freeze any unused aquafaba for up to 2 weeks.